WHY CALL BICYCLE REPAIR MAN? Our shop hours are flexible. We’re available almost anytime. Most repairs are completed in 1-3 days, so your bike will be ready to ride when you are. If you can’t bring your bike to us, we’ll pick it up and bring it back when it’s fixed. You can get to know your mechanic, and get tips on taking care of your bike and good places to ride it. Our business is keeping bikes on the road and running right. We’ll give you an honest estimate of the cost of repairs, no matter what condition your bike is in. Our prices are comparable to retail bike shop rates. We keep our overhead low so we can provide extra convenience and remain affordable. We know bikes because we ride them ourselves. We understand your needs. 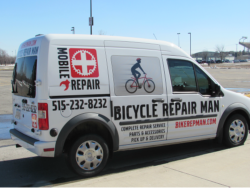 Bicycle Repair Man provides complete service for all brands of bikes. We specialize in general and preventive maintenance and collision repairs, and we are able to work on almost any type of bike, including coaster brakes, 3-speed and internally-geared hubs. While most of our customers are recreational riders, daily commuters and long-distance tourists, we are happy to work on any sort of bike for any type of rider. We provide on-site support for group rides and events of all kinds. Our service area includes the City of Ames and the surrounding area. * Add a rear rack to carry your jacket when you get warmed up. *Attach some baskets to that rack and you can bring home groceries. *Add panniers instead and you can take your laptop and a change of clothing to work. * Lights let you ride safely after dark. * A bike computer will tell you how far you’ve ridden and how fast you’re going. Whatever you want to do with your bike, accessories will make it happen. * We pack and ship bikes anywhere. We’re glad to provide a no-obligation estimate on any job, large or small. EDUCATIONAL SERVICES We teach safe riding, bike tour planning and bicycle repair and maintenance classes for individuals and groups. Please call to schedule yours.